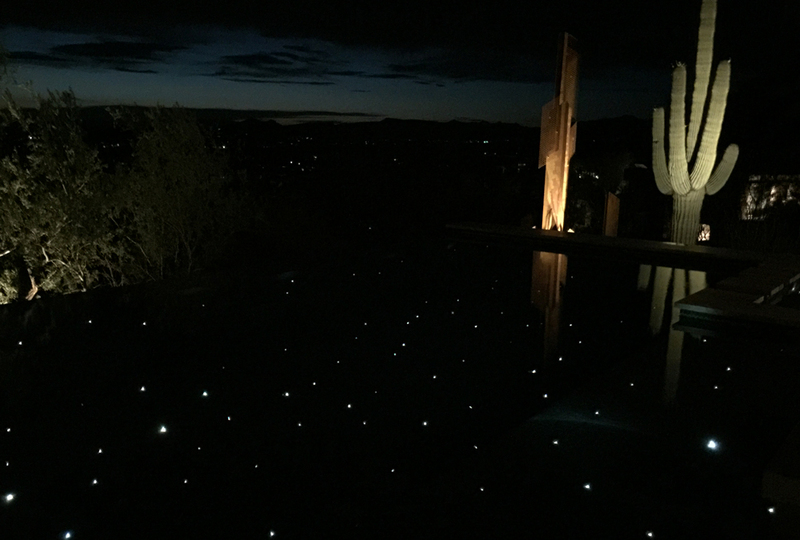 Capture the beauty of the universe in a pool with a fiber optic Star Floor. 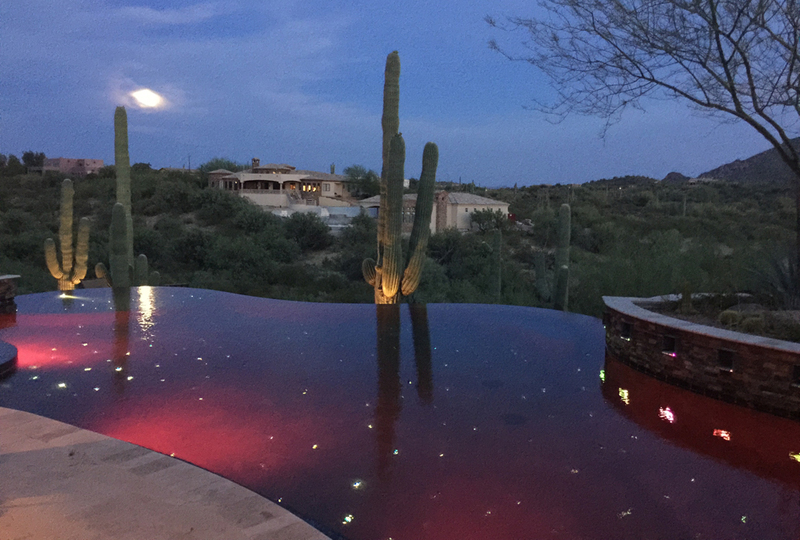 This innovative water feature lighting system can easily be added to any pool, waterfall, or spa, elevating the charm and sophistication of any design. We have the manufacturers’ specs available for design and construction considerations. 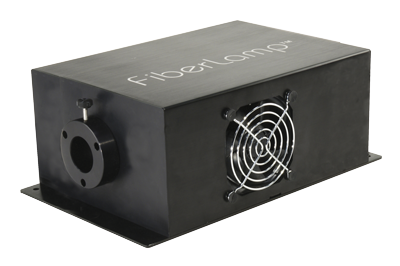 Why Design With Fiber Optic Lighting? 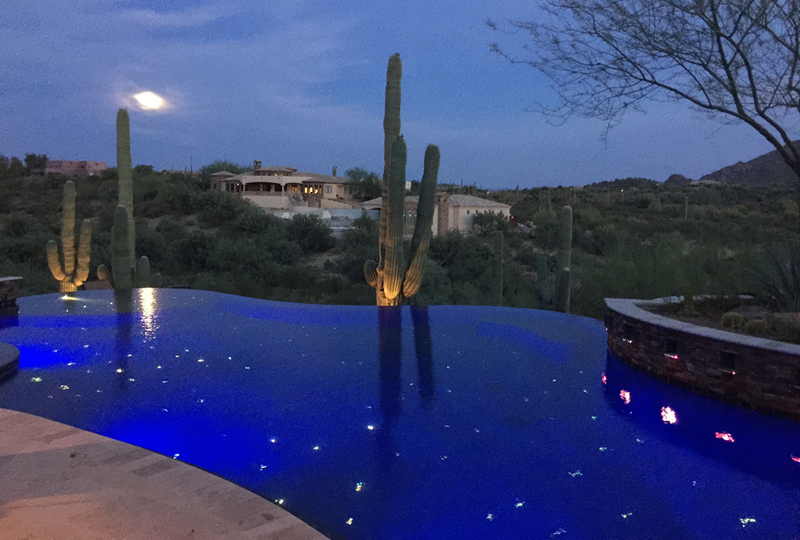 Conventional lighting tends to underwhelm pool owners and rarely showcases a pool’s best features, whereas a twinkling fiber optic star floor becomes a dazzling feature in itself. 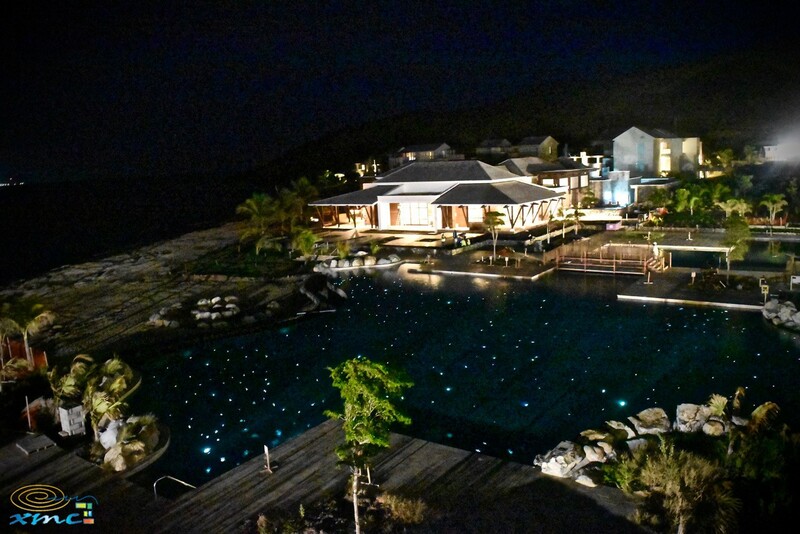 A conventional lighting system is expensive to power and difficult to access and maintain. These new and unique color changing lighting systems use fiber optic cables to conduct light produced and controlled remotely. Countless patterns, colors and effects including twinkling can easily be created with this versatile technology, as the cable ends lie flush with the surface in which they are embedded and the lighting is programmed through an accessible controller. Fiber optic stars draw the observer closer with a shimmering glow. 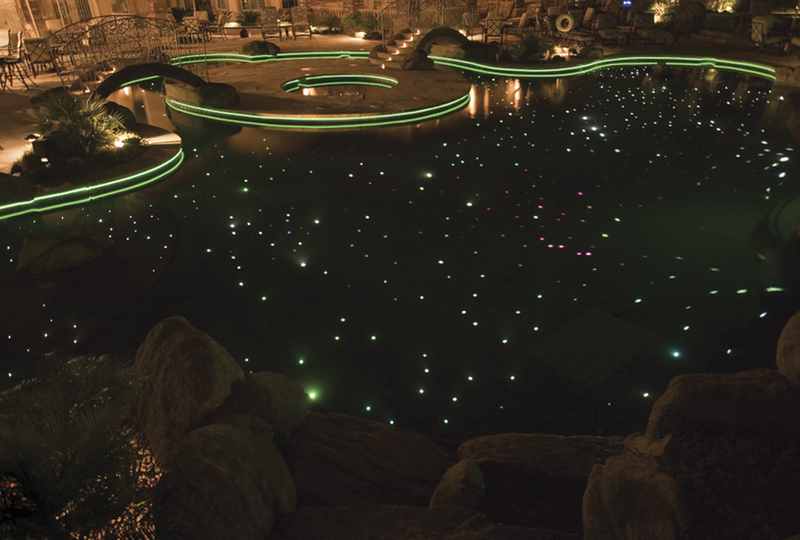 This twinkling effect brings a sense of awe and wonder to any midnight swim. Pool owners hope to create a backyard retreat. 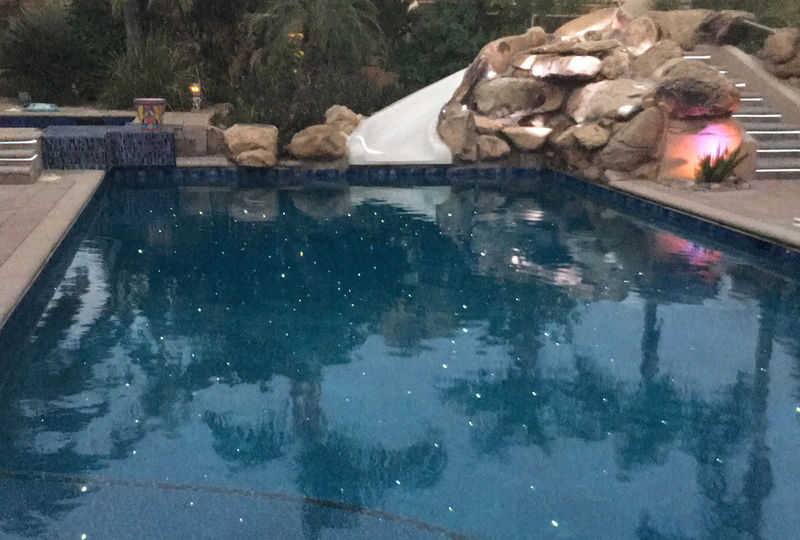 With a star floor feature as part of the design, an ordinary pool becomes a focal point and quickly transforms a yard into a beckoning oasis. The combination of strategic landscaping and enhanced pool design brings maximum value and curb appeal. 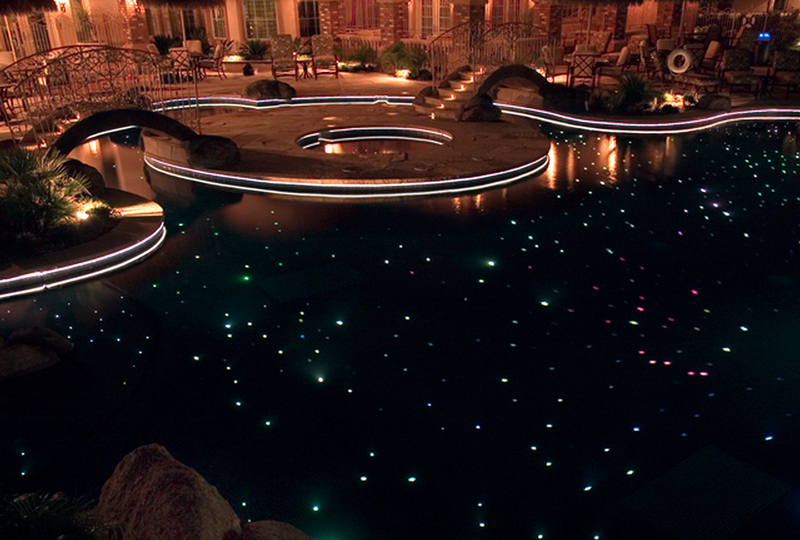 Fiber optic lighting is the unique feature pool owners long for, bringing charm and style to their investment. 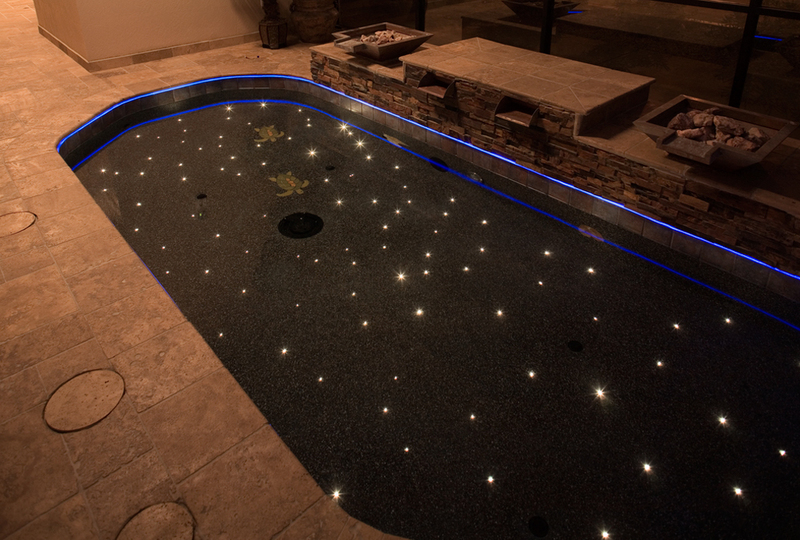 Contact us to find out how a Pool Stars star floor can enhance your design today. Nothing Like the No-Twinkle Kits! To Calculate how many stars you will need, take the surface area and divide by 2 for approximate number of stars. Kit includes PVC design layout and over the phone and email technical support. Onsite consulting or turnkey installation also available at an additional cost. Custom Sizes Available. Call for Details! 1,000 .75mm strands – white, RGBW or RGB Amber (Turtle Lighting). In Florida, the bright lights of urbanization often overpower the moonlight that normally guides newly hatched turtles to sea. And the results can be tragic. Lured by artificial lights, tiny hatchlings along the coastline head for hotels, condos or highways instead of the ocean. Confused and disoriented, they are crushed by cars or wander in circles. In many cases, they die from dehydration or predators. RGB Amber, otherwise known as Turtle Lighting helps prevent this from happening.